You'd have thought Apple would have updated the page you see above with some sort of "having more trouble than we thought, please be patient" type message. 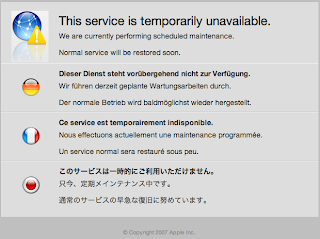 Rather than the vague "normal service will be restored soon." For people who rely on dot mac, today has been extremely frustrating and what's foolish is that Apple could have solved the problem and made their customers feel better with about 30 minutes worth of work. I'm not even talking about going on Twitter and responding to people who were complaining. Just update the "we're down" page guys. NB: I've been able to send and receive email sporadically all day via my Apple mail account, but the online version has been showing the screen you see above. 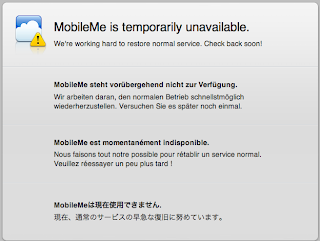 UPDATE: 9:00 AM EDT and Mobile Me is up and running. Loading slow but looking very cool. Could well have been worth waiting for, he says, his eyes glazing over with the familiar stare of the Mac devotee. UPDATE 3: 10:15 AM EDT - Still down, but at least the message screen acknowledges that there are issues. Apple listened?